Internationally renowned singer Lionel Richie touches down in Australia next week for a series of concerts as part of his global tour. Along for the ride in the role of support act is Australia’s own Guy Sebastian. The twosome kick off their tour at Auckland’s Vector Arena tonight, but in amongst all the fun and frivolity of the tour, the duo knows that people in certain parts of both New Zealand and Australia are still hurting from the terrible natural disasters that have befallen us across the past few months. 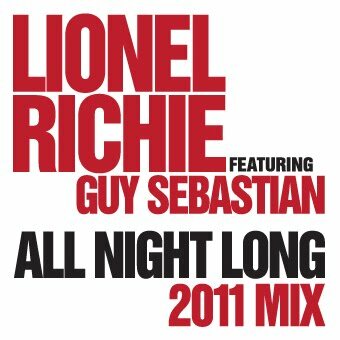 Floods, cyclones and earthquakes have battered our region, so Guy and Lionel have teamed up (alongside internationally acclaimed producer RedOne) to create a new version of Lionel’s 1983 hit ‘All Night Long (All Night)’. Released to the Australian iTunes store today, all involved in the recording of the reworked version have donated their time and effort and with a little help from the Australian and New Zealand public, plenty of funds will be raised in the hope of rebuilding shattered communities. 100% of proceeds from the sale of the single in Australia will be donated to the Queensland Premier’s Disaster Relief Appeal. 100% of proceeds from the sale of the single in New Zealand will be donated to the New Zealand Government Christchurch Earthquake Appeal. So get onto it kids. Those of us in Australia can buy it HERE. If you’re in New Zealand, meanwhile, nab it from HERE. Thanks auspOp. It’s an awesome version. Their voices go great together. It has already reached #26 on Oz itunes and #5 in NZ. Hopefully it raises lots of money. great cause and great remix!